Every day I feel like we are inching closer and closer to the sci-fi-esq world that I used to dream up as a kid. It seems like technology is making the dreams possible. 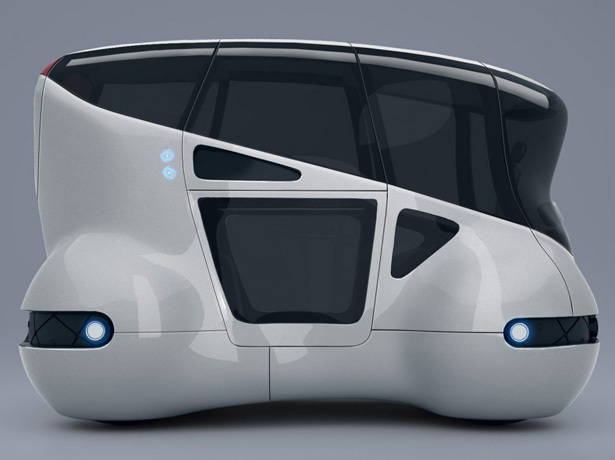 Here are a few futuristic ideas for transportation that look more and more interesting ever day. 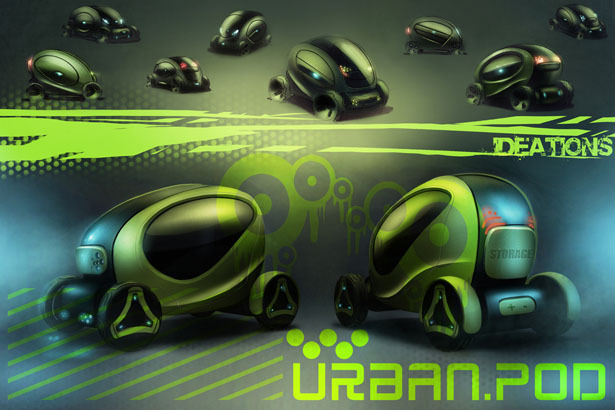 XOIO and IUM (Institute of Urban Mobility) have teamed up to design a futuristic vehicle for our future: Mobuno. 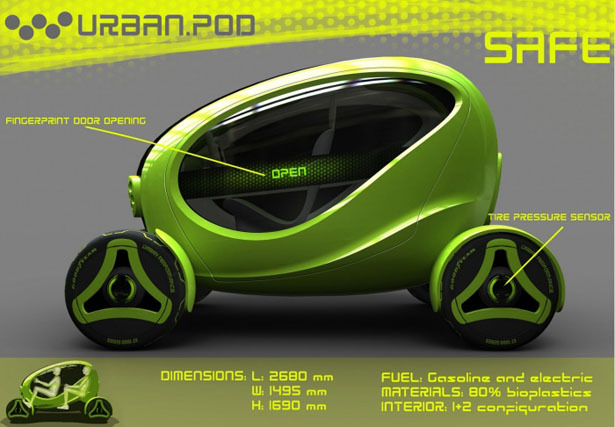 It’s a conceptual urban mobility yet highly realistic idea, the goal of this project was to blend all those great benefits of current means of transportation into one. User can book Mobuno privately just like any regular taxi for private use, connection with mobile communication devices are used for all communication just like usual. Mobuno is designed to accommodate up to four persons, they can use this compact car simultaneously. Just in case you don’t mind sharing a ride, you can also switch to “Shared” mode, Mobuno will then act as a bus smartly responding to the requests of other users. In this way, all users would enjoy the benefit of lower costs. Hanging out with several friends or multiple family members won’t be a problem, simply book and tell the operator how many people would go along then it’ll send as many units as required. Smart platooning will also allow effectiveness by combining units into an energy efficient queue. Mobuno from XOIO offers public transportation better than trains and busses. The smart system of Mobuno can decide when it’s time this car needs to be fueld, cleaned, and maintained, it’ll automatically look for closes service point. The smart artificial intelligent also allows Mobuno to learn patterns of requests so that the network can smartly distribute units to a certain location where they are needed the most. 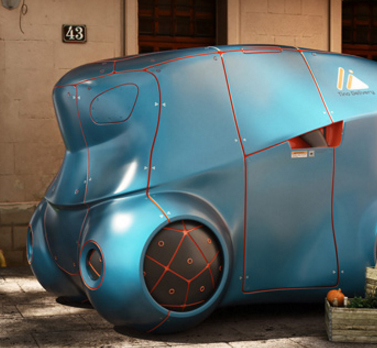 Due to its super compact size, this vehicle can squeeze tightly together, it doesn’t require much parking space. 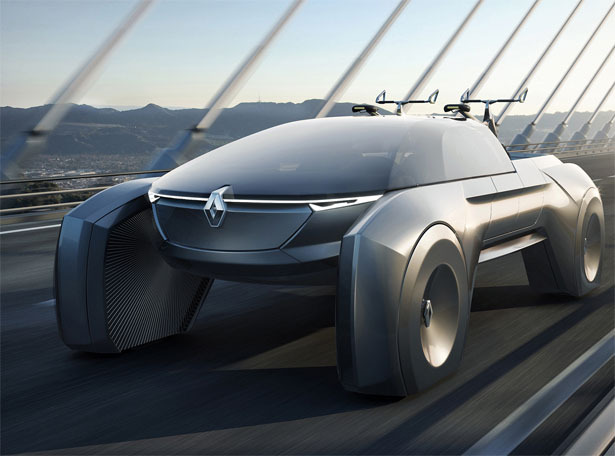 Renault Subtil Concept Pickup Truck offers luxurious, capacity, safety, and comfort of an SUV. 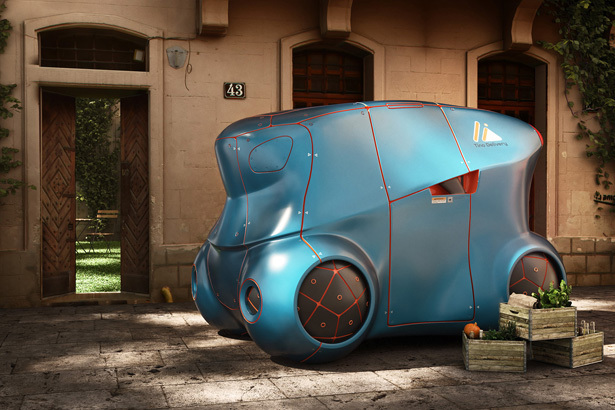 Wojciech Jurkowski, an automotive designer, explains that most people who live in big cities often don’t have the luxury to enjoy road trip due to the small capacity of their vehicles. There’s an increasing demand on Western European market for bigger cars, because there are so many attractive places there among mountains and rivers where people can leave crowded cities to find fresh air and peaceful place to relax. 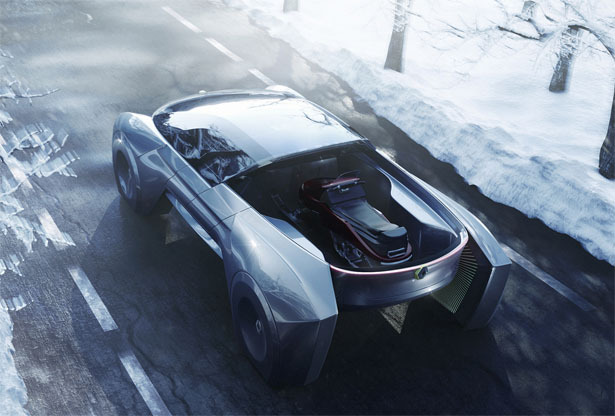 Renault Subtil by Wojciech Jurkowski is designed with four independent electric motors, installed inside the wheels. The interior offers spacious area designed for passengers and their luggage. Inspired by Renault, Subtil features similar Renault’s design DNA, both for its originality and freshness. That visibly separated wheels introduce a new style is car design, that is highly possible due to the use of electric motors. The folding roof allows user to adapt its vehicle to their needs. User can easily transform vehicle from a family car to a pickup truck that carries up to three bikes. 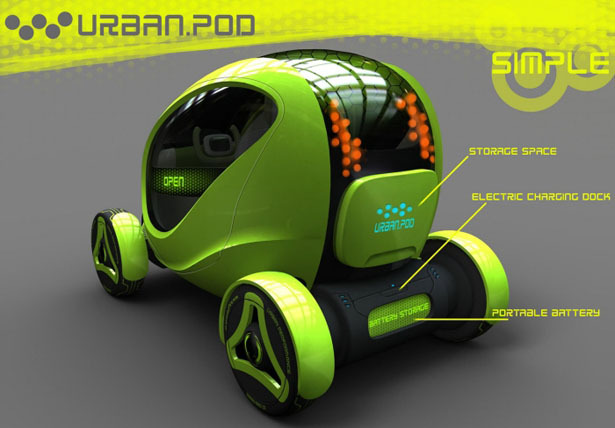 The URBAN.POD compact vehicle has been designed for you to explore the urban jungle in style. It’s a small 1+2 city car aimed at both young and experienced drivers that want to explore the city with style and safety. It is primarily built from bio-degradable plastics (bio-plastics), which can be made from several natural sources like vegetable fats and oils, corn starch, sugar cane etc. 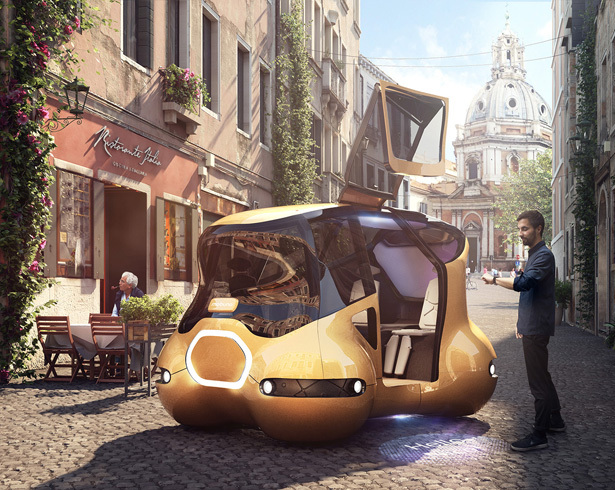 This compact vehicle also offers several solutions to increase the safety of the passengers and decrease traffic with car-to-car sensors for optimal traffic. 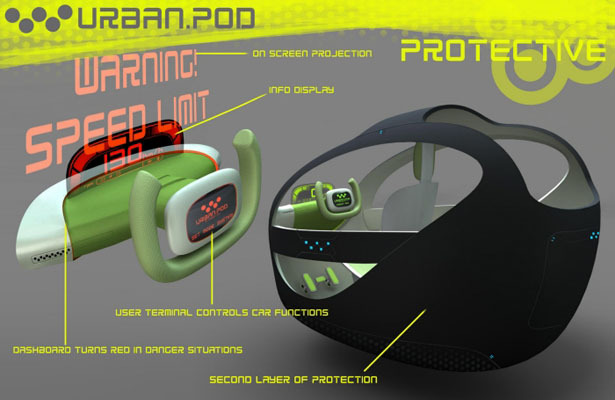 Okay, overall there are some pretty cool concepts here. Although it's not a dystopia vision of the future, I imagine if I saw any of these cruising the streets of New York City I would feel like I have made it into the future.